Mustang is located in the central Himalayas of Nepal, north of the Annapurnas and Dhaulagiri and bordering Tibet. Mustang holds many treasures and is a gateway to the past. It has been opened to the tourists only recently. 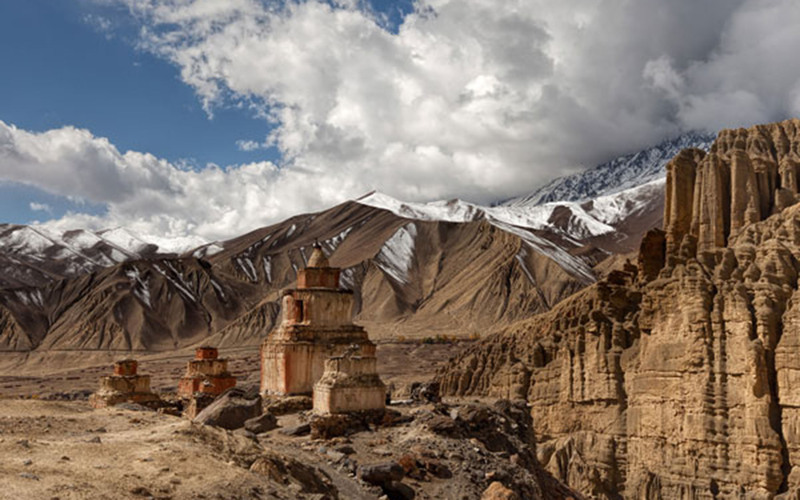 Mustang is in Nepal, even though it is situated within a series of arid valleys on the Tibetan Plateau. 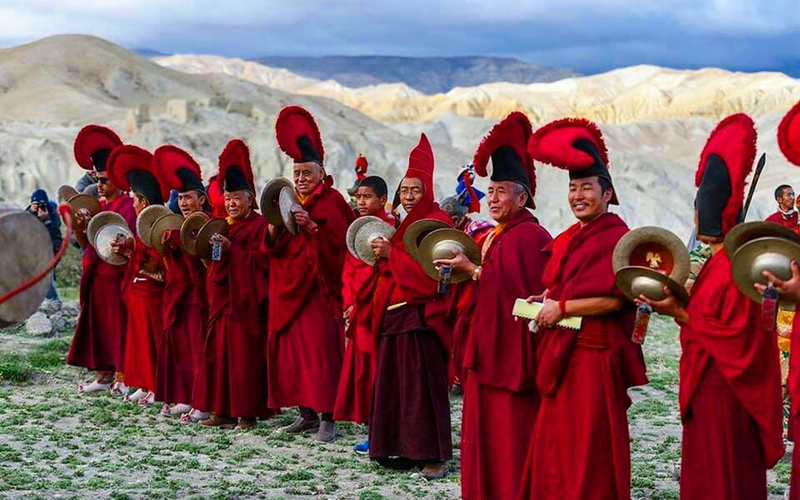 Mustang is home to a thriving culture of Buddhist farmers and traders. The villages are typical of those remote regions of Tibet where people follow a traditional lifestyle many centuries old. 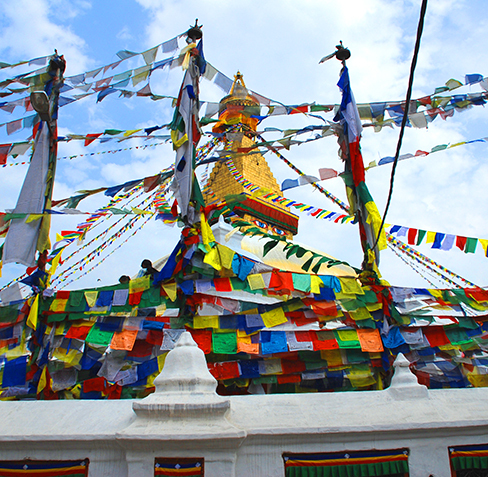 Villages are clustered near large monasteries with prayer flags of the five colors fluttering in a constant breeze. The geological formations of the valley cliffs are fascinating. The trail will alternate several times between short steep ascents and descents, always leading higher. The twelfth century seems to still exist here with small curving lanes, markets where barter is as common as the exchange of currency, and ancient fortress castles protect the valleys from invaders. The caves of devout Buddhist ascetics can be occasionally seen even today. 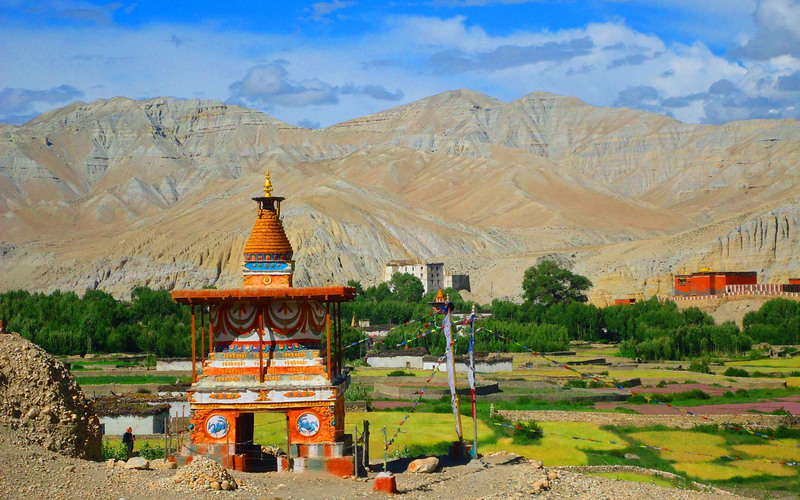 Lo Manthang at around 3,700 meters is the capital of Mustang and the home of ‘Lo Gyalpo’ (King of the South). Here we past more chorten into mountains lined by sandstone cliffs and caves. Lo Manthang is a maze of narrow little streets, markets, bazaars, traders, and mule trains from Nepal and Tibet. Monasteries representing several sects of Tibetan Buddhism are also present to explore, all possessing truly ancient and impressive statues, books, icons, and relics. Three Star Hotel Accommodation with Breakfast in Kathmandu (4 Nights). Trek Accommodation in best available Tea House Lodges/Guest Houses (12 Nights) with Three meals (breakfast, lunch and dinner). All necessary paperwork, trekking permits, government and local taxes. After breakfast, we take an early morning flight to Pokhara (and enjoy amazing views of the Himalayas from the right side of our plane. Upon our arrival in Pokhara, the beautiful lake city. Upon arrival at Pokhara, we will be transferred to our pre-booked hotel. Free time for independent activities or venture around the beautiful lake side. We take an early morning flight to Jomsom (2,713 meters). The 25 minutes flight to Jomsom can be one of the most stunning experience flying over the Kali Gandaki, the deepest gorge in the world with two of the world’s highest peaks (Annapurna & Dhaulagiri) towering off each wing tip. Upon arrival at Jomsom, Our trekking crew will make an necessary arrangement for a trek and then we begin our trek following the Kali Gandaki Valley on an open trail. The first one hour is relatively flat until we reach Eklaibhatti. We stop here for a quick rest and move on towards Kagbeni. Kagbeni is a fairly large village with its own monastery. 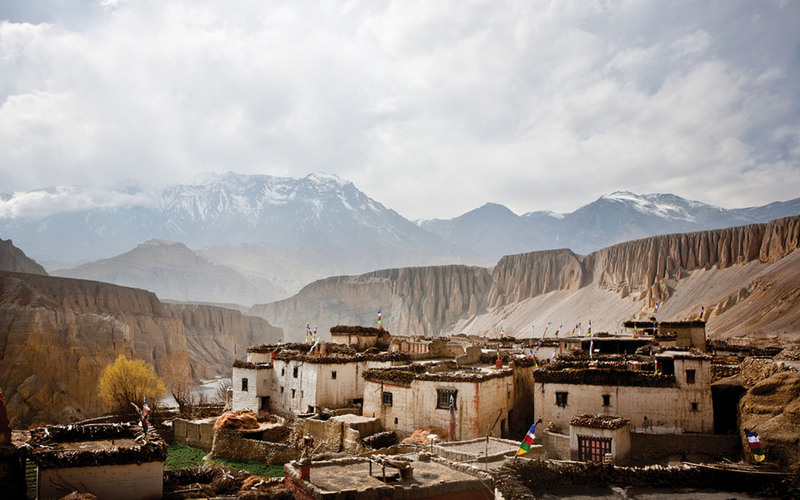 Almost all the villages in Mustang have their own monasteries, some of them are very old. Here we will see old settlement with many old ruins. Overnight at Kagbeni. Now, from this point the restricted area of Upper Mustang begins. We have to make our move as early as possible as It gets very windy after the sun heats up. We get our permits checked at the check post and continue with a trail alongside the Kali Gandaki River. We walk on sand amidst strong winds before ascending on a hill. We reach the Tangbe Village and admire its narrow alleyways, white-washed houses, barley and buckwheat fields, and apple orchards. We continue our walk and pass another village and cross a river on our way. Next, we walk on a ridge before reaching Chele Village. Overnight in Chele. From Chele, the trail gradually gains altitude and we might experience a little Strenuous compared to what we experienced till day before. Our walk today involves crossing two passes, Taklam La pass (3,624m) and Dajori La pass (3,735). On our way, we enjoy great views of Tilicho, Yakawa Kang and Damodar Danda and pass by Ramchung Cave. We descend further and reach Samar Village. From here we walk on a trail above the village and reach a ridge. Next, we descend on a steep trail to a stream and continue our trek to Syangpochen. From Sangpochen, it is a small uphill walk, but it is the high point on the entire route. At Nyi La Pass (3,970 meters), you will see prayer flags and stones collected as offerings to local mountain dieties. Continue downhill mostly to the village of Ghami. Ghami has many lodges and houses. It is about 4 hours from Sangpochen. For the afternoon, you will rest or look around the village. Ghami is located in a beautiful setting with river flowing at back of the village. Across the village, the mountains seem painted in gray and red mud. Walk down the river, cross bridge, and climb up to the “Long Mani Wall,” probably the longest one in Nepal. We will then cross a small pass and walk down to the village of Tsarang, about 3 hours from Ghami. We will have our lunch there. After lunch we will follow the Tholung Valley, the trail gets levels and broad. We will reach the lonely “Chorten” that demarcates Tsarang and Lo Manthang. From the Chorten climb a little to have our first view of Lo Manthang town. In about 40 minutes, we will reach Lo Manthang. 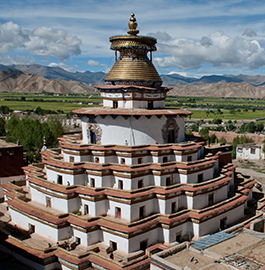 Lo Manthang or “plain of the south” is a walled city with only one entrance gate at the northeast and one back door. The walls are as high as 15-20 meters. There are about 400 houses within the city, the pavements are narrow, and the streets are quite confusing. The king of Mustang, “Lo Gyalpo,” lives in the city. His palace is situated in front of the main entrance. The palace is a huge old white building. Other places of interest are the four monasteries. 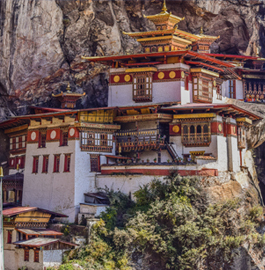 Choede monastery is the largest one, and it follows Sakyapa sect of Tibetan Buddhism. There is a school for the young monks. Jampa monastery has a big old statue of the future Buddha “Jampa Gonpo” measuring some 50 feet. Here, we will get a feeling of an ancient civilization. After breakfast, We leave Lo Manthang taking the same route back until we reach the broad trail from where we will be going right to the village of Marang. It takes about 4.5 hours. After lunch, the trail falls off suddenly into a steep muddy trail for about 30 minutes to the village of Dakmar. From here, it is about 1 hour to the village of Ghami. From Kagbeni, we will take left uphill and continue to Muktinath. It takes about 5 hours. Muktinath is the famous pilgrim center for Buddhist and Hindus alike. There are 108 waterspouts where pilgrims take baths to wash off their sins. Below the main temple, we can see the ever-burning flame in a small temple which locals consider sacred. we may encounter strange dressed Hindu pilgrims and ascetics coming in from as far as southern India. We will walk down to Jomsom, which is about 4 hours. Today is the last day of our trek after trekking for a while in Mustang trails. We can probably have a small party with our staffs. The local apple brandy is the most famous product of the region. After Breakfast, we fly back to Kathmandu via Pokhara and check in to our pre booked hotel. Have a nice warm shower, relax or explore around the streets of Thamel. This is an extra day in case of delays due to flight, weather, landslide etc. The rest of the day is free for independent activities or do some souvenir shopping or can explore any other areas of Kathmandu. Let us know and we can arrange for that.